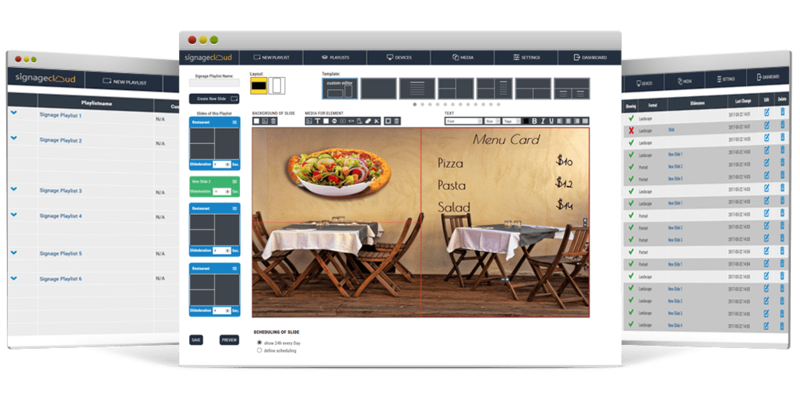 Signagecloud’s powerful digital sign web-based display control software is packed with so many features and is so simple to use you’ll wonder how you ever managed your screen without it. Show websites or Social Media feeds or create dynamic content by implementing RSS-feeds of your choice. Media-Upload via Drag’n Drop and automatic file conversion. Upload your own logo, change your styles and colors. Use one of more than 150 professionally designed layouts or create your own design with the Web-Editor. Create multiple playlists and add your content slides. Manage one or several of digital signs from a single account. Set a timer to every playlist, which enables you to decide which content you want to show at definable time frame. Organize your devices in groups to manage and control them in a comfortable way. Easily display dynamic content that auto-updates. Digital Signage Software features include content builder, conditional content scheduling, one layout for all resolutions, device management & more. We provide a cloud-based digital signage solution. One low monthly price. No long term contracts. No setup fees. Increase your sales and accelerate your business with our signage platform today! Digital Signage Android App features include full screen browser and autostart function. The app is available for free of charge to download for all non-trial signagecloud members in dashboard. Signagecloud web-based solution allows you to easily create, control and modify the content on your digital sign from any internet enabled device.